On the historic Republic Day 2012, Indian Development Foundation (IDF) launched `Clean India Movement' across the nation. IDF team all over India have announced the launch of `Clean India Movement' and exhorted every citizen of this country to join hands for making a better India of our dreams. NCC/NSS/Scouts/Guides, members of various housing colonies and educational institutions and industrialists and many social ambassadors have joined hands for spreading awareness on cleanliness. Special mention about Ingraham Institute from Ghaziabad, where over 6000 students have pledged their support for Clean India Movement. Mumbai University NSS volunteers from Bhavans College in Mumbai have performed special street plays with the theme on Clean India.......There will be series of event that will go on across the nation to spread the message of Cleanliness. MAKE IT A GREAT MOMENT AND MOMENTUM IN LIFE. 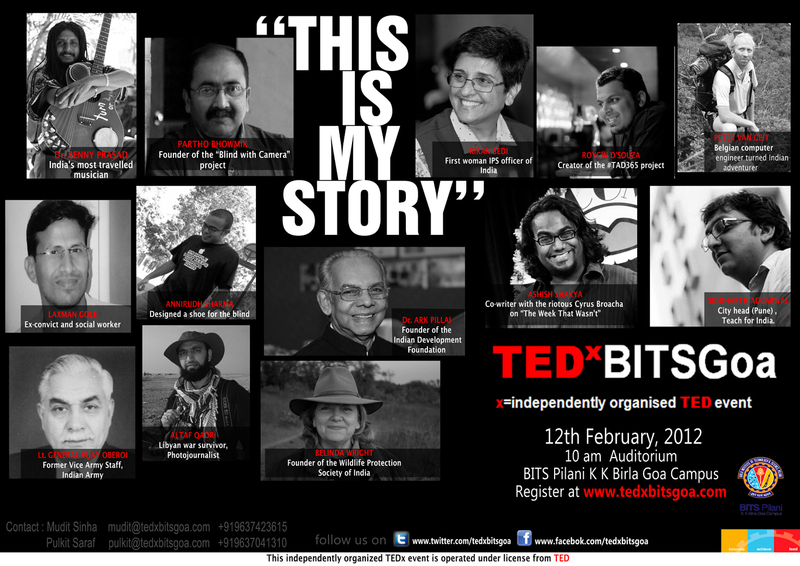 This is the official poster release of TEDXBITSGOA. 13 speakers, 13 inspiring lives, 13 must-hear stories, 13 aspects about yourself you might never know about. Dr.ARK Pillai, Founder President, Indian Development Foundation (IDF) is invited as one of the speakers for TEXxBitsGoa event on 12-02-2012. For more details please visit www.tedxbitsgoa.com. great honour for IDF Family. 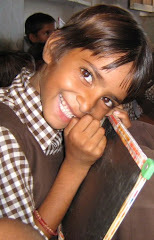 IDF's Mariam Bal Gurukul in Ghaziabad inaugurated on 19-01-12. IDF (Indian Development Foundation) inaugurated three Bal Gurukuls on 19-01-2012 in Ghaziabad and making the total to 65 Bal Gurukuls in India. IDF express special thanks to the Social Ambassadors - Vikas Gill - Kamini Sharma - Rekha Bajaj - for their kind support in launching these three Bal Gurukuls. Also thanks to Dr.Hepesh Shepherd and Mrs. Sapna Shepherd from Ingraham Institute, Ghaziabad for their wonderful social responsibility. IDF promotes goodness unlimited. IDF - Educate - Empower - Enlighten. IDF's iDiscover program - A Scientific Treat to young minds -19/1. As part of IDF's iDiscover program to inculcate scientific temper in young minds, students from Holy Spirit School, St. Mathew's School, Sir J.R. School and Utkarsh Marathi School were taken to Nehru Science Centre, Mumbai on 19-01-2012. The day long program (10am to 5pm) kept the children busy updating various scientific information. Children were awestruck when their bus used Worli Sea-link and gave a wonderful view of the sea. iDiscover is the brain child of Wg. Cdr. S. Balasubramaniam Vr.C. , IDF social ambassador, which promotes to trigger scientific temper. Thanks to NSS volunteers from Vivek College who co-ordinated the entire trip in a scientific manner. 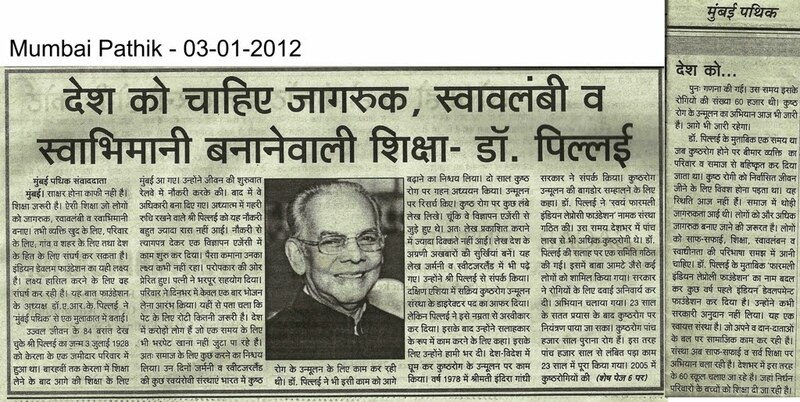 Corporate Leader and Humanist Shri N.R. Narayana Murthy, Chairman Emeritus, Infosys received Mother Teresa Memorial Award 2011 for his excellent contributions in India's development. 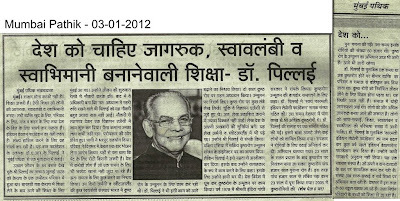 The Award was instituted by Indian Development Foundation and presented at NIMHANS, Bangalore on 19-12-2011. Felicitations were made by - Prof. Pankaj Chandra, Director, IIM Bangalore - Dr. P. Satish Chandra, Director and Vice-Chancellor, NIMHANS - Dr. H. Sudarshan, Hon. Secretary, VGKK - BR Hills - Dr. A.R.K. Pillai, Founder President, IDF - Rotarian E. Sumesh, Trustee, IDF and Rotarian Aunali Rupani, Trustee, IDF. IDF's Cyclone `Thane' RELIEF WORK. IDF team celebrated Pongal Festival with the cyclone-affected families in Cuddalore District in Tamil Nadu. Students from Podar International School visited St. Catherine's School, Andheri (W), Mumbai for celebrating Kite Flying Festival (Makar Sankrant) on 13-01-2012. Indian Development Foundation organised the social responsibility programme for both the schools while social interns from ITM Business School co-ordinated the event. IDF young social ambassador Nishchith presenting a musical tribute to Shri NR Narayana Murthy who received Mother Teresa Memorial Award 2011 at NIMHANS Bangalore on 19-12-2011 for his excellent contributions in India's progress. The Award was instituted by Indian Development Foundation. Nishchith's mother (Mrs.Thriveni Barkur) has been providing motivational support to the young social ambassador's passion for music and social service. Nishchith is studying in class VIII in Kendriya Vidyalaya, MEG & Centre, Bangalore and has been supporting IDF's social programmes for nearly five years now. IDF is proud of its social ambassadors who are the change-makers. RELIEF FOR CYCLONE `THANE' - IDF team is getting set to take up relief measures and support programmes for the people affected by cyclone `Thane' in South India. THOSE WHO WISH TO CONTRIBUTE FOR THE CAUSE AND HELP PEOPLE AFFECTED WITH CYCLONE (materials of daily use - food - clothing etc.) may write to idftamilnadu@gmail.com/ idfindia@gmail.com. Mr. S. Sreeram (09840040191) and Mr. K. Sathyamurthy (09380240407) from IDF have taken the lead to mobilise materials. Your valuable support will help in the overall process. We Can, Let's Clean is a social initiative by Oxford English School at Malwani, Malad (W) Mumbai to inculcate environment friendly and clean habits in young minds. The children enthusiastically participated in the movement. Dr.Narayan Iyer, CEO, Indian Development Foundation congratulated Mr. Abrar Husain Syed, Managing Trustee, Oxford School for launching suc h a meaningful programme. 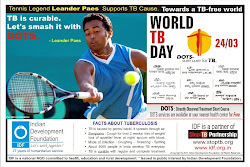 (WHO) to test TB patients for drug resistance. While Iran first reported TDRTB cases three years ago, India seems to be only the second country to report this deadly form of the disease. 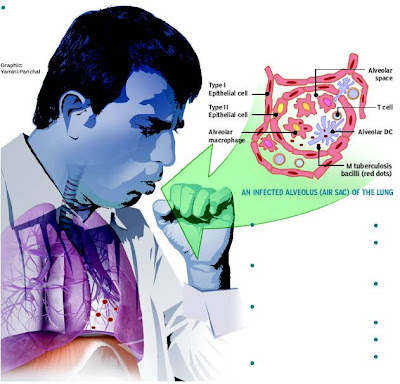 TDR-TB is the result of the latest mutation of the bacilli after Multi-Drug-Resistant TB (MDR-TB) and Extremely Drug-Resistant TB (XDR-TB) were diagnozed earlier. Even more worryingly for Mumbai, 10 of the 12 TDR-TB cases are from the city, while the other two are patients from Ratnagiri and UP. One of the 12 patients has since died. India sees around 3- 4 lakh deaths for all forms of TB each year, while the world saw 1.7 million deaths in 2009. As the full form of TDR-TB suggests, none of the known TB combination drugs work on the patient. All 12 showed resistance to 12 drugs. “The TB bacilli have obviously mutated. The emergence of TDR-TB has grave implications for public health,’’ said Hinduja Hospital’s Dr Zarir Udwadia, whose observations have been published in the latest issue of the US-based Clinical Infectious Diseases (CID) peer review journal. 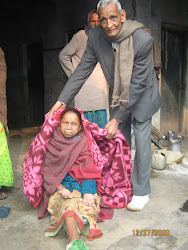 His team started isolating TDR-TB cases among patients with pulmonary TB in October 2011. Dr Amita Athawale, who heads KEM Hospital’s chest department, said TDR-TB was a reality in India. “The cases we clinically isolate are just the tip of the iceberg,’’ she said. 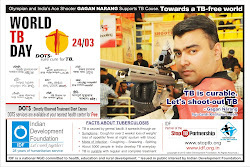 TB is one of the biggest killers in India, along with heart attack. Among tuberculosis patients, drug resistance develops mainly because patients fail to complete the 6- to 9-month first treatment phase. “They feel better within a couple of months of taking the drugs and so they stop taking them. However, the TB germs in the body are not completely vanquished and they again multiply,’’ said a senior BMC public health official. IDF young social ambassador Nishchith speaking at the Mother Teresa Memorial Award function organised by Indian Development Foundation at NIMHANS Bangalore (19-12-2011) to honour Corporate Leader and Humanist Shri N.R.Narayana Murthy for his contributions to India's development. Nishchith spoke on inspiration and dream for the young minds. Nishchith quotes "There is a fuel in us, which needs to be 'ignited with sparks'. We are all inventors sailing out on a voyage of discovery, guided by a private chart, of which there is no duplication! The world is all gates of opportunities. All we have to do is go and find them. "